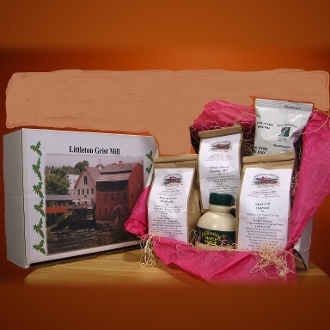 This box has a picture of the Littleton Grist Mill"s Water Wheel on its cover. This box includes 1- 1 lb. Pancake Mix 1- 1 lb. Muffin Mix 1- 1lb. Steel Cut Oats 1-8 oz. NH Grade A Dark Maple Syrup 1- NH coffee pillow pack sample (Makes 1 pot of coffee) Ships in a large flat rate box USPS. Shipping included in the price.